Most humans on this earth love their children and strive for a better future for them. That is not the case with the Arabs in Gaza, whose sole obsession is with murdering Jews. As has become customary in recent years, this summer will see hundreds of thousands of small children in Gaza enroll in summer camps organized by terrorist groups. Social activities, religious studies and sport competitions aside, the children will engage in what is the undisputed crowning centerpiece of those camps: the semi-military training that includes use of live ammunition and simulated kidnappings of IDF soldiers. Each year the military wings of various Gazan organizations vie for the hearts of the young recruits, eager to ready themselves for fighting Israel. Thus, this year Gazans will be able to send their children to the summer programs offered by Hamas, the Islamic Jihad and the Popular Resistance Committees. The terror groups take the summer camps very seriously, regarding them both as the ultimate tool of recruitment of future generations of fighters and as means to raise public support for their activities. 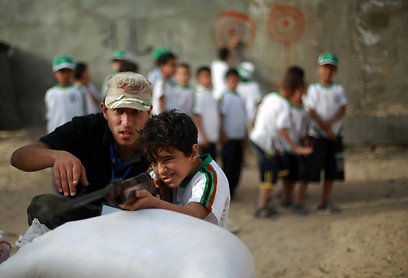 The summer camps afford children their first encounters with neither live weaponry nor the ideology of resistance, inculcated zealously through Hamas' education system. The camps are rather an extension of that education, where learning to shoot a firearm is part of the curriculum.